I wanted a simple skirt with a hanky hem. Serendipitiously I found this pattern for 25 cents at the thrift store with uncut paper! Thrilled with my find I also purchased a limpid looking flat sheet for $1.00 and went home to quickly construct my practice muslin. If you have never done a yoke before this one is great to start with as there is no zipper. The top is gathered with elastic and therefore doesn’t have to lie as smoothly as a fitted yoke. Additionally the yoke does not have a facing to complicate matters. Simple hem almost begs for some terrific trim. The pattern instructions tell you to make two circles, one of the yoke and the other the skirt body and then sew them together as you would a set-in sleeve. I expected more of Kwik Sew because this ain’t quick. If you are someone who likes a fitted waist this pattern is too unstructured for you. Look at the pattern instructions on this one and decide if that is going to work best for you. I sewed the front yoke to the front skirt and put that aside. I did the same for the back sewing the back yoke to the back skirt. Then I attached at sides making sure my seams met at the bottom edge of the yoke. Faded bedsheet for the practice muslin. It did have a nice enough striped jacquard weave for me to edge the finished muslin with a small lace just in case it turns out I want to wear it. The gathered waist at the yoke top does not suit me. 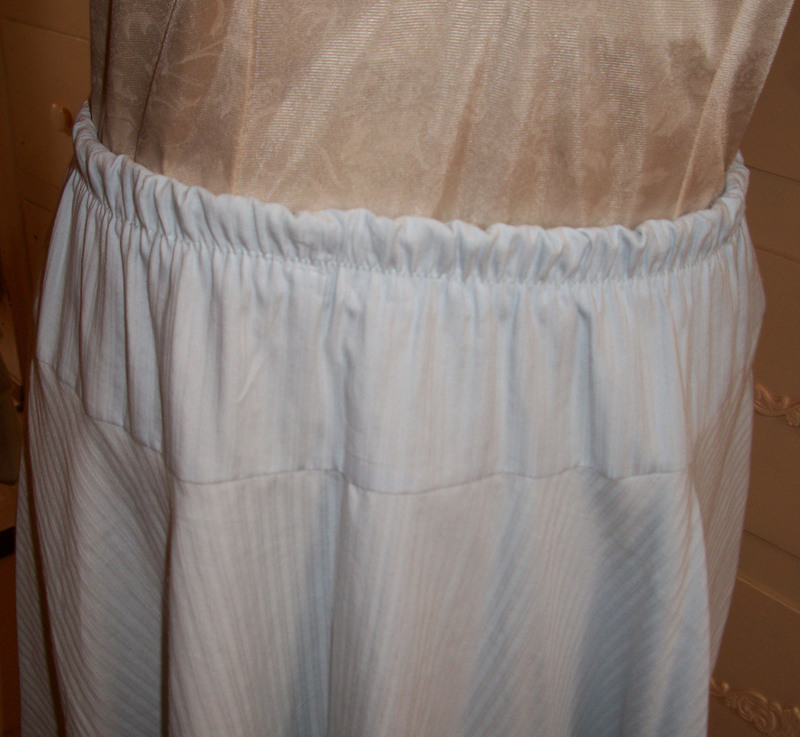 The yoke itself was too wide and I shortened it by giving the waistband an extra turn. Still I did not like this skirt on me. Here is a photo of the complete skirt. Maybe. I am going to keep this pattern around as an option since I think the idea is very versatile. This design looks like a sure thing as it is so simple but there are a few things to consider. The gathered waist ending in a strong design line at the bottom of the yoke did not look good on me. The soft bunchiness contrasted too sharply with the otherwise angular lines of the skirt. If you buy drawstring skirts off the rack and they always look good – you almost consider them a classic – then this design may work well for you. Since the finished piece takes a bit of yardage I would tinker with cheap fabric before investing in more expensive material. Overall Style Grade: B, it is a versatile canvas for the experienced and easy to sew for beginners. Results Grade: C, it’s okay. I would probably make it again if I was certain to have a top that would hide that yoke. Further Menswear Design Details:Where is All of the Interfacing?